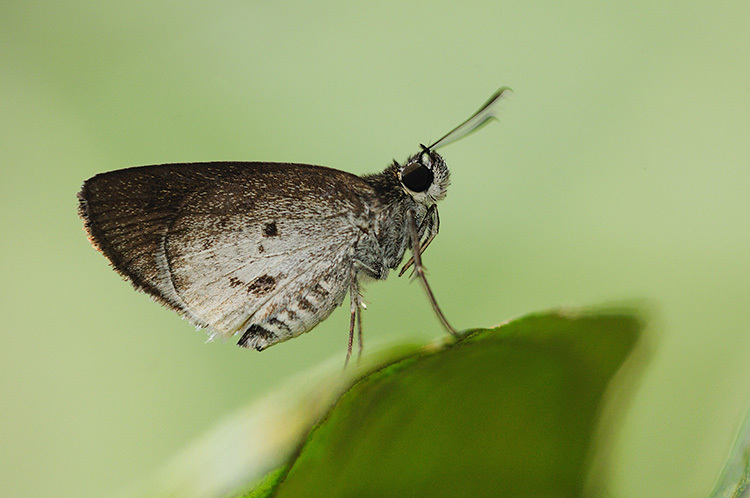 This small and insignificant-looking skipper was a new discovery for Singapore when it was first encountered. Perhaps the early authors missed it as its distribution is rather local and restricted to habitats where its caterpillar host plant, a palm, grows. With a wingspan of up to only 28mm, it is a skittish flyer like most skippers, but prefers to lurk in the shady areas of the forests. It typically perches on the top surface of a leaf with its wings folded upright. This White Palm Bob was photographed in the nature reserves by ButterflyCircle member Mark Wong. The butterfly is dark brown above, whilst the underside of the hindwing is largely whitened with a dark greyish spot at the dorsal area of the hindwing.